Against Empathy? 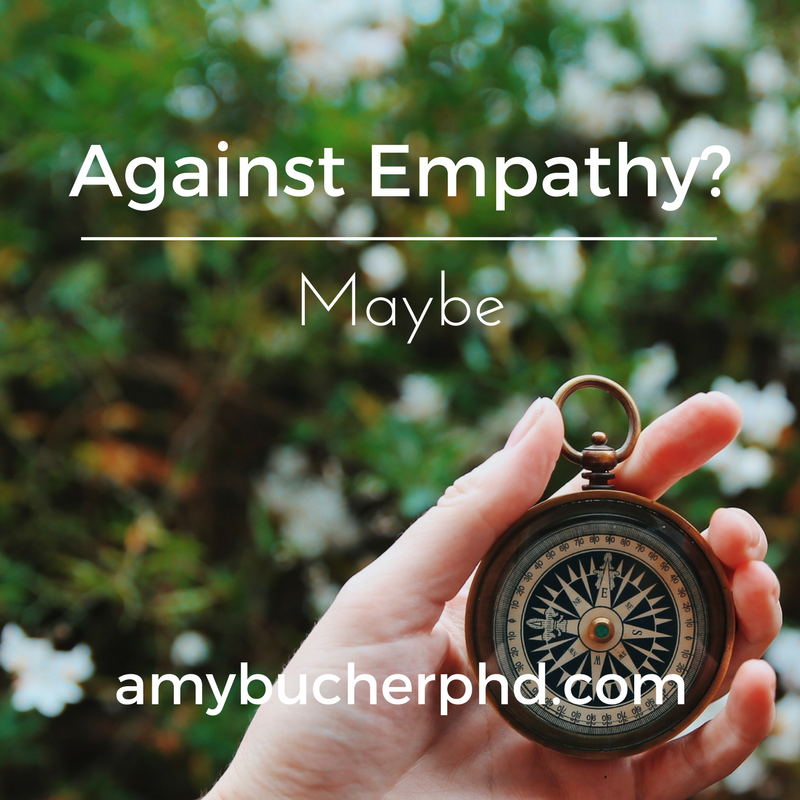 Maybe | Amy Bucher, Ph.D. I just read Against Empathy by Paul Bloom and have some thoughts. I picked the book up partly because of the provocative title. My work relies heavily on empathy–or what we call empathy–to understand the challenges and needs of people who will eventually engage with the product or experience we’re designing. Could it be that empathy is the wrong tool? After reading Bloom’s book, I think: Sort of. I agree with what I understood to be Bloom’s main point against empathy. He posits that empathy, if you understand it to be taking on the feelings of a person, is not the most effective mechanism of achieving positive and prosocial behaviors. It’s not a necessary prerequisite to kindness or morality. And it can backfire in some circumstances, either by bringing unnecessary vicarious pain to the empathizer, or by focusing a person’s attention on one party at the expense of others (such as floods of donations to a handful of needy people whose stories are compelling when others go unhelped). I myself have written about empathy not being the right tool to use, such as when someone is being racist; not all views deserve empathy. That said, I think much of the book relies on splitting hairs by taking on a very specific definition of empathy that doesn’t fully align with the way most people use the term. Bloom is careful to define the empathy he is against as this taking on of others’ emotions and perspective. He notes that cognitive empathy, understanding the circumstances in which others find themselves and their likely thought patterns, is a more critical component of doing good. I think the research we typically include in the design process taps into cognitive empathy more than the emotional type. Of course talking directly to people about their experiences will usually arouse some type of emotional response, but what we take back to our teams to work with is the intellectual information we’ve gathered. The emotional empathy generated in this process helps me feel accountable to the research participants to incorporate what I’ve learned into our designs. I’ve never seen empathy as practiced in design fall into the traps Bloom cautions against, of great vicarious pain, distraction from a more deserving audience, and so forth. That’s not to say it never happens, but it’s not been my experience. I think Bloom also overlooks (or considers outside the scope of this work) a rich area for discussion about how people might deliberately deploy empathy to achieve certain ends. Bloom establishes that empathy can essentially be weaponized to focus people on helping one group at the expense of another (for example, create an emotional empathy for victims of a crime in order to strengthen determination to punish the perpetrators). Clearly, politicians are masters of creating empathy reactions to do just this in favor of their own legislative agenda. There are probably ways to use empathy for persuasive good, as well. I think there’s an interesting opportunity to explore empathy as a deliberate persuasive tactic. I’d definitely recommend reading Against Empathy if you are concerned with empathy as a design practice. While I disagreed with some points and agreed with others, it made me think critically about the term empathy and how we use it.